1.12. Our skipper Leif Ramm-Schmidt has been elected chairman for Avomeripurjehtijat ry. (The Finnish Offshore Racing Association) in the meeting on 30.11. We congratulate! 25.11. The new Finnish ProSail Magazine focusing on sailing and racing has published an article of Tarantella's third come back. Read the story by author Juha Partanen (in Finnish) here. 24.11. Achievement graphs updated. Check next years calendar. 21.11. Winter has come to Tarantella's resting place in Kantvik. Check also usage statistics for the site since January 2004. 28.9. Pictures from this years races have been updated regarding Offshore Week, Henri Lloyd Race, Syysseilaus and Sokeri Pohjalla. Check our photoalbums. If you are interested in larger versions of any of the pictures, please contact us and we'll send them to you. 26.9. Sokeri Pohjalla Race (LYS) in Kirkkonummi on 25.9 was sailed in a good wind with a few strong gusts, sunshine and heavy rainfall. We had to change Genua 1 to Genua 2 in one of the gusts giving the crew a tough time. A fine end of the season. Tarantella finished first with Marc Hinnenberg at the helm. Other crew members were Juhana Salminen, Thomas Stenius, Thomas Riska and Risto Kinnunen. Kari Frankenhaeuser's Ridas 35 "Kiialiina" finished as second. The third place went to Jukka Knopp's Swan 36 "Merikotka". Official results. After the race the mast was taken off and now Tarantella is prepared for the lift ashore. 12.9. Victory for Tarantella in the last ranking race for the season! Syysseilaus, which included a windward/leeward race and a short archipelago race was sailed in strong, but quite steady winds and light rain - the true essence of offshore racing! All maneuvres were executed almost perfectly and the only loss was a rather big tear in the big spinnaker, that luckily kept together to the end... Our second helmsman Christian Öller did a good job. We won the wwd/lwd race of 3,2 nm with a margin of only 13 s and the longer (14,4 nm) archipelago race with ca 40 s over Fifty Fun. We secured thus our first ranking victory through times. Official results. See also Tom Finell's and Juanita's stories. 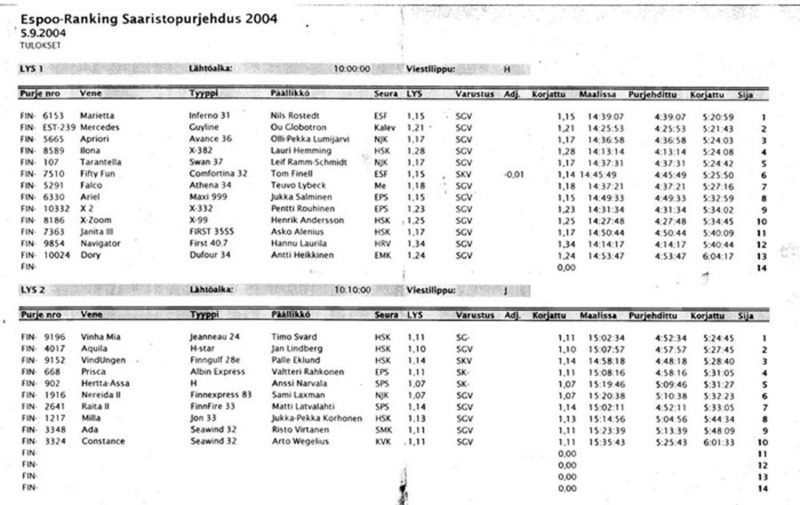 7.9 Results for Saaristopurjehdus (LYS) 5.9. here. In the ranking our leding position seems very safe now. Finell has a theoretical chance to win if he is the first in the last ranking race (Syysseilaus on 12.9.) and there are 10 participants or more and we finish as no. 6 or worse. 5.9. Second place in Henri Lloyd Race with FiftyFun finally as the winner. FiftyFun was fastest over all and Tarantella third. Admiral Finell seems to have got excellent speed on the boat, now with the older mainsail and a more favourable IMS-rating. The race was the fastest we ever sailed with an average speed of almost 7 knots. Results here. In Saaristopurjehdus (LYS) we were not successful this time. Tarantella ranked 5:th. with FiftyFun as 6:th. 13 boats participated in our class. Very light winds in the start. We had a bad start, and came en route among the last boats. Results here. 28.8. Line honors and victory for Tarantella in the annual S&S Association Regatta, eventhough our tactics failed miserably on the downwind leg, where we chose the right side (being the wrong side), reducing our 9 minute lead in sailed time at the upwind mark to 2 minutes on the finish line... After all 5 minutes margin in corrected time to second boat Swan 36 Adelfe. 13 S&S designed boats participated in this traditional non-spinnaker LYS-race. Results. 24.8 The official results for Helsinki Tallinna Race are now available on KoPu's site. Besides victory for Tarantella in ORC 2 over Juanita with about 44 minutes and FiftyFun with 53 minutes, Tarantella was second in ORC over all. Our tactics and choice of sails proved to be almost unbeatable and gave us a third victory in this race. See results here. Tom Finell has a nice story of the race on his site (in Swedish). See also Juanita's story (in Finnish). 15.8. Victory for Tarantella in the rough weather Veritas Pentala Race! The race had quite a few unfortunate situations: Carabilla III was hit in the side by Laura and had to retire for the season, Nornan first trawled and lost their spinnaker and Dix had to retire because of bad broaching upwind (official results). And do read Mr. Finell's story! (in Swedish). 5.8. You can now check route recordings for the IMS Champs'. 1.8. The IMS Champs' for 2004 are now finished. Second place for Tarantella, that had a tough fight with the winner Econen. Read also Econen's story here (in Finnish). In the Ranking we still have a strong lead over FiftyFun, even with one race less. 31.7. Tarantella fell back to second place in the IMS Champs', after a "black Monday"-like sailingday. First we had problems with the topping lift that came loose all of a sudden, resulting in a crewmember almost falling over board. Luckily this happened before the first windward/leeward-course. On the race course the genua halyard's sheath broke and it took us about 5 minutes to get the sail down and up again with the second halyard. Thus the 5th place in the results. On the longer course (25 nm) we lost roughly a minute when the genua sheet came loose in a tack, and as there was no room for tacking back, we had to struggle a bit to get te sail trimmed again. 30.7. Tarantella leads the IMS 3 in the IMS Champs'. With victories in both of the leeward/windward-courses and a second place in the long (85nm) offshore race, we are leading Econen by 0,75 pts and Fifty Fun by 5,90 pts. IMS 2 is ruled by X-Yachts, with Tetu IV (X 362) first, Sydney (X 362) second and Lapland Hotels (MM 32) third. IMS 1 is also ruled by X-Yachts, with the Imagine (IMX 40) leading the pack. Birgitta (IMX 40) is second, and Jukebox (IMX 40) third. 27.7. Open Finnish IMS Championships - Offshore Week - starts Thursday. A total of 41 boat are participating, including two Swedish and one Estonian boat. All the yachts are going to carry GPS- and GPRS-based transmitters from Indagon and the feed is presented on a screen at the race office at NJK Björkholmen and also hopefully on a webpage in some form. 12.7. Our newest partner is Ylläs Travel Service, that caters to our skiing needs in the winter! IMS 1, IMS 2, IMS-SM, ORC-Club 1, X-99. The results didn't significantly effect the ranking. Please note, in IMS 1 the points for Espoo Suursaari Race are calculated with last year's coefficient 1,1 instead of 1,0. 3.7. Tarantella is not participating in the Round Gotland Race and will instead be heading towards Åland for a vacation cruise. The next challenge is the Finnish IMS Championships starting July 28. 14.6. Suursaari pictures updated. If you're interested in the originals of any of the pictures, please contact us and we'll e-mail them to you. 14.6. Our own calculations show that we also took the Over-all victory in Espoo Suursaari Race, calculated as time/nm. 8.6. First pictures from Suursaari Race. 7.6. First victory for the season as Tarantella took her second victory in Espoo-Suursaari Race. A very peculiar and above all fast race for us. We finished as the 7th boat over all, with only a few IMS 1's arriving before us. Results here and at the race site. Hufvudstadsbladet noted the event. 4.6. Espoo-Suursaari Race starts today at 21:10. A huge number of boats are attending. It looks like the weather will be sunny and warm and the wind decreasing from the west, so the bigger boats in the different classes might have the upper hand. And we are happy to hear that our competitor Fifty Fun will also be attending with a borrowed rig. Check the IMS-participants here. 31.5. Updated results and pictures for WB. And read Fifty Fun's story (in swedish) of their catastrophy. 30.5. Second place in WB-Sails Round the Buoys! The new Carbo-Cuben G1 was a success even in 30 knots apparent wind! 30.5. WB-Sails Round the Buoys was a rough ride as approximately half of the boats got a DNF. Our best and worst competitor Tom Finell with his Fifty Fun lost the rig in the second start and had to retire. We regret Tom's loss and hope he will have a new mast as soon as possible! Econen and Tarantella dominated in the IMS 3, Alfa Romeo in IMS 1 and Sydney in IMS 2. Results and pictures soon. 26.5. First test of the new CarboCuben G1 revealed it to be a very nice sail! Perfect body and no stretch, combined with record boat speed in light wind is very promising. Take a look at the pictures in the Kantvik, May 04-folder. Next trial is scheduled for today. 24.5. The season begins tomorrow with a transfer from Kantvik to NJK. The new genua and some other modifications will be tested for the first time this year. The pumps onboard got tested yesterday as the log-transducer was left out as the boat got into water... Some 600 liters of newly leaked seawater had to be pumped out. Next time we'll be sure to check for leaks immediately after launch! 9.5. Graphs of Tarantellas achievements in different races can be found in the calendar and on recent result pages. 8.5. 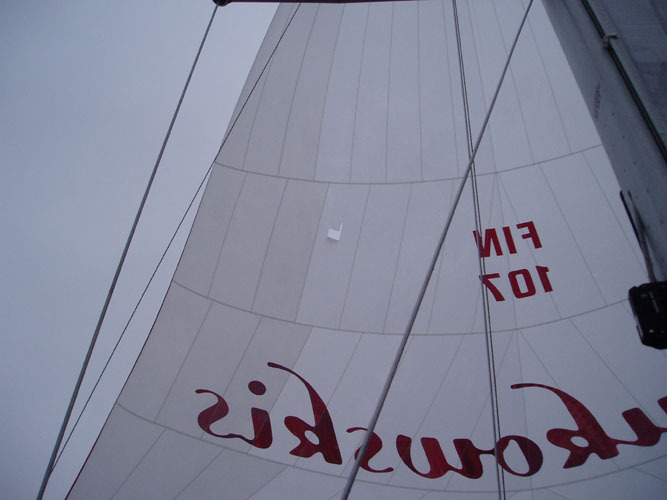 According to the 2004 IMS-regulations, the number of sails onboard is now regulated by the yacht's GPH. The applicable limits are >720.0, 720.0-585.0, 584.9-505.0 and <505.0. As the majority of the Finnish fleet ranks in the second category, the number of sails onboard is also the same on all the yachts. Of the top-end players in IMS 1, only Luna (Finngulf 46) and Aquavit (ILC 40) are big enough to qualify for two extra jibs and one additional spinnaker. In IMS 3; Econen (Albin Express), Inkeri (S&S 6.6) and Merimari (Dufour 28) will have to do with one jib less. 14.4. Weatherlinks have been added. You find them under Racing -> Weatherlinks. Runt strategy and hygienic food preparation for long distance races" is now available here (in finnish). The strategy is based on last years course, but an overview of the new course is also presented. Request password fom webmaster. 20.3. CarboCuben will be the material of choice for Tarantella in 2004. Reason is our last year's CarboCuben-G2 from WB-Sails, that was unparalleled in performance, superseeding even our marvelous Kevlar-G2 from 1992. A new, at least 150% genua is planned for the season and with the recent discussions on the optimum size of an IMS-genua, it will be interesting to see how it will work out. 23.2. The roof is rigged again! Three men and two hours was all it took this time. It seems as if the practice is showing off... Pictures. 16.2. Vene 04 Båt has closed its doors. Approximately 91'000 visitors attended the fair and at least 10'000 visited Tarantella. Many interesting stories where told and heard and we are very pleased with the attention our Old Lady received. No casualties and no damages either to the boat or the crew have been reported. The pictures are here. 7.2. The new boating site e-Satama.com recommends visiting Tarantella at Vene 04 Båt. Read the article. 6.2. Vene 04 Båt has begun with Tarantella on MTV3's Huomenta Suomi. We welcome all to take a look at the boat that according to Senior Skipper Heinz Ramm-Schmidt looks remarkably new. Nautor founder Pekka Koskenkylä, also remarkably young, will be at the stand Friday-Saturday. 3.2. Building our stand at Messukeskus. Raising the mast, polishing the sides and building the stairs was today's program. 2.2. Tarantellas achievements from 1967 to 2003 are now posted in the History -> Past-section. 30.1. Tarantella arrived at Messukeskus today. A very empty hall was waiting for her, so the transport was a smoot business. Take a look at the pictures. 26.1. The creator of Nautor in the 60's and the man behind the "Swan"-brand, Pekka Koskenkylä, will be attending the international Helsinki boat show "Vene 04 Båt" as a guest on board Tarantella. Pekka is on location Friday the 6:th and Saturday the 7:th of february. We welcome all Swan-owners and other interested for a chat at our stand 4 a 6! The press release and press invitation is here. 13.1. Season is beginning! Tarantella "sailed" from Kantvik to Lindgrens yard in Helsinki. 11.1. You will find the yearbooks of 2000, 2001 and 2002 (in swedish) in the History-folder. 11.1 The Lady got a bit of fresh air today as we took down the roof! 2.1. Tarantella will be at the Vene 04 Båt-exhibition in Helsinki 6th-15th of february. Welcome onboard at the Avomeripurjehtijat-stand in hall nr. 4! 2.1. Nautor has purchased the first Swan that sailed the waters off Pietarsaari in 1967. A total refit is planned for the beautiful Tarantella I and she will serve as personell recreation and in PR-work in the future. Tarantella II wishes her "little sister" all the best ! Hufvudstadsbladet wrote a story on the subject. Also Jakobstads Tidning noted the event just before christmas.